One of my social media clients, Lapicida, works closely with interior designers, architects and specifiers. My regular blog for Lapicida also included creating ‘interior designer’spotlights’ where we feature a leading name in interior design and explore their latest works. This one for Christopher Jenner of London, that I published using Magento, was fascinating to write. Interior Designer Spotlight: Christopher Jenner. 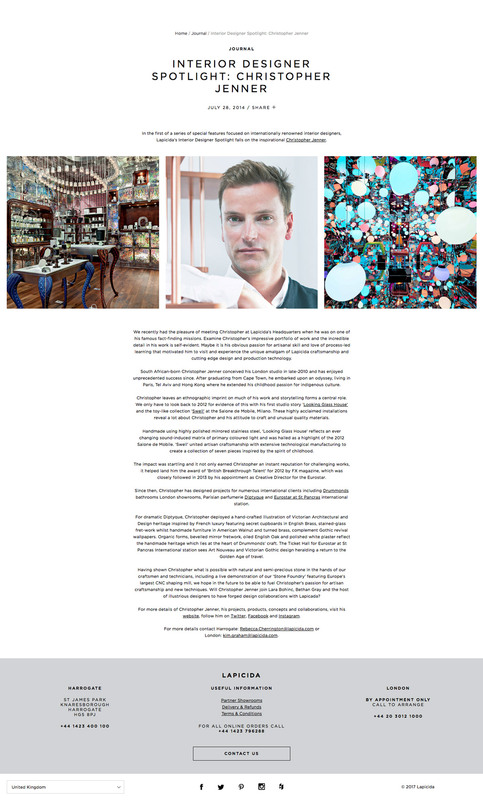 EveryIn the first of a series of special features focused on internationally renowned interior designers, Lapicida’s Interior Designer Spotlight falls on the inspirational Christopher Jenner. We recently had the pleasure of meeting Christopher at Lapicida’s Headquarters when he was on one of his famous fact-finding missions. Examine Christopher’s impressive portfolio of work and the incredible detail in his work is self-evident. Maybe it is his obvious passion for artisanal skill and love of process-led learning that motivated him to visit and experience the unique amalgam of Lapicida craftsmanship and cutting-edge design and production technology. South African-born Christopher Jenner conceived his London studio in late-2010 and has enjoyed unprecedented success since. After graduating from Cape Town, he embarked upon an odyssey, living in Paris, Tel Aviv and Hong Kong where he extended his childhood passion for indigenous culture. Christopher leaves an ethnographic imprint on much of his work and storytelling forms a central role. We only have to look back to 2012 for evidence of this with his first studio story ‘Looking Glass House’ and the toy-like collection ‘Swell’ at the Salone de Mobile, Milano. These highly acclaimed installations reveal a lot about Christopher and his attitude to craft and unusual quality materials. Handmade using highly polished mirrored stainless steel, ‘Looking Glass House’ reflects an ever-changing sound-induced matrix of primary coloured light and was hailed as a highlight of the 2012 Salone de Mobile. ‘Swell’ united artisan craftsmanship with extensive technological manufacturing to create a collection of seven pieces inspired by the spirit of childhood. The impact was startling and it not only earned Christopher an instant reputation for challenging works, it helped land him the award of ‘British Breakthrough Talent’ for 2012 by FX magazine, which was closely followed in 2013 by his appointment as Creative Director for the Eurostar. Since then, Christopher has designed projects for numerous international clients including Drummonds bathrooms London showrooms, Parisian parfumerie Diptyque and Eurostar at St Pancras international station. For dramatic Diptyque, Christopher deployed a hand-crafted illustration of Victorian Architectural and Design heritage inspired by French luxury featuring secret cupboards in English Brass, stained-glass fret-work whilst handmade furniture in American Walnut and turned brass, complement Gothic revival wallpapers. Organic forms, bevelled mirror fretwork, oiled English Oak and polished white plaster reflect the handmade heritage which lies at the heart of Drummonds‘ craft. The Ticket Hall for Eurostar at St Pancras International station sees Art Nouveau and Victorian Gothic design heralding a return to the Golden Age of travel. Having shown Christopher what is possible with natural and semi-precious stone in the hands of our craftsmen and technicians, including a live demonstration of our ‘Stone Foundry’ featuring Europe’s largest CNC shaping mill, we hope in the future to be able to fuel Christopher’s passion for artisan craftsmanship and new techniques. Will Christopher Jenner join Lara Bohinc, Bethan Gray and the host of illustrious designers to have forged design collaborations with Lapicida?